I’ve made it my mission to convert those who think they don’t like beets. With red, golden, and Chioggia, roasted, raw, and fried, there are so many ways to enjoy the humble beet that I think beets deserve a second chance or third or fourth. When Leela at She Simmers mentioned the beet challenge, I decided right away I had to contribute something. I almost always roast beets whole and then peel and chop them. More often than not, my roasted beets end up in a salad of some sort. 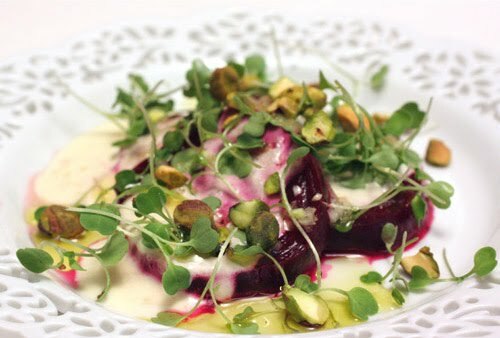 I spotted this warm beet salad in the May issue of Living magazine. It’s very simple to assemble, and the flavors were eye-poppingly good. One more item of business: the pretty plate in the photo above was sent to me as part of a fun plate swap organized by Cheryl at A Tiger in the Kitchen. My new plate came from Heather at BodaciousGirl. Thanks Cheryl and Heather! The beets were roasted with a splash of olive oil and a sprinkling of salt and pepper. Once removed from the oven and cool, they were peeled and sliced. A vinaigrette was made with shallots, Banyuls vinegar, and extra virgin olive oil. I was intrigued by the use of Banyuls vinegar, and I have another recipe that recommends it as well, so I splurged on purchasing a bottle even though it’s an expensive vinegar. It’s a French vinegar made from sweet wine, and the flavor is milder than typical red wine vinegar. Its taste is closer to wine than vinegar usually is but there is some acidity. 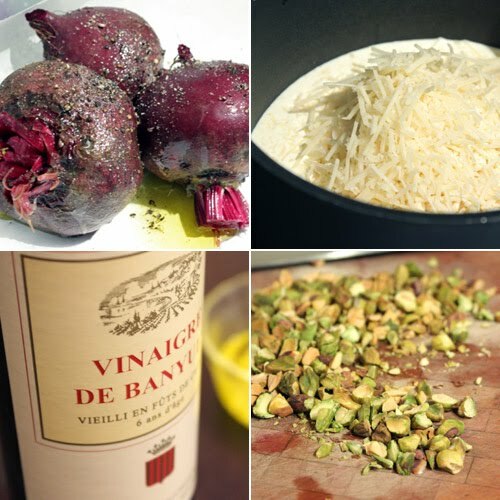 Certainly, this salad would also be delicious with a vinaigrette made with another red wine vinegar, but the flavor of the Banyuls was very nice here. The vinaigrette was set aside while the parmesan dressing was made by warming cream, adding shredded parmesan, and stirring until smooth. There was supposed to have been some thyme in the cream and parmesan mixture, but my plants failed to survive the summer heat, and I forgot to buy thyme at the grocery store, so I skipped it. 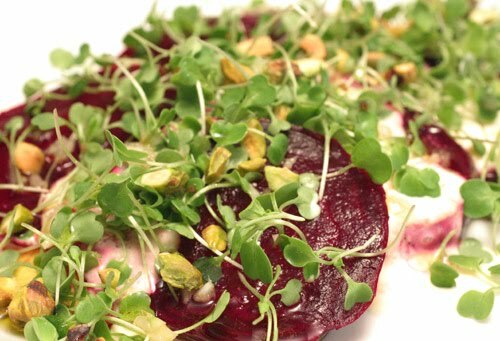 The salad was assembled by placing the sliced beets on a platter, the warm parmesan cream dressing was spooned onto the beets, and then some arugula micro greens, and any baby greens could be used here, were strewn about on the warm dressing. Those greens were drizzled with the shallot vinaigrette, and last but certainly not least, some chopped pistachios were added. This could be the dish to change the minds of all the beet haters out there. If it’s the earthiness of the beet root that they object to, then they should taste beets with this simple, warm, parmesan dressing. The richness blends with the flavor of the beets in a lovely way, and the greens and vinaigrette perk up the salad and keep it from being too heavy while the pistachios add crunch and one more layer of flavor. I already like beets, but trust me, this is a really, really good beet salad. Yes! Beets are good! When you said fried, that had ears perking, but they're really good if made right. You picked really nice flavors for them. This salad is very original and really delicious looking! Nice combo! Beautiful. I love it that you paired the beets with pistachio. I wouldnt have thought of that. The colours are awesome. I had a beet salad w/ nuts for lunch yesterday, yours looks beautiful! I could eat beets everyday. This is a lovely salad with beets, love the parmesan dressing and pistachios here! A roasted beet salad with parmesan dressing and pistachio nuts sounds like a great gourmet dinner salad! Ok, I have to admit that I'm not much a fan of beets. It's sad, I know. I think it's because I don't eat it enough. I think it's time I change that and I think a beet salad may be just the thing to get it started. OMG, I'd die for this salad! I love beets, although that is technically a miracle as we never had the good variety when I grew up, but still there is something irresistible about them and this is a lovely (and very healthy) salad! Personally, I adore beets & grow them in my garden every summer. Unfortunately, I've never been able to convert my hubby or kids. They just don't know what they are missing. I'm going to make this & don't care who doesn't like it! Wow that looks delicious and a great way to eat beets!!! I love beets and am always looking for another way to eat them! I love beats, and was just wandering through the produce section today staring yearningly at all them in their glory. They looked fantastic. Now with this recipe I have a great excuse to go back and secure my own. And here is where I bemoan my fate of being married to a man who hates beets. This salad looks absolutely heavenly but I know he would never eat it. I'm going to have to file this away for a girls' night. Gorgeous presentation. That is SO BEAUTIFUL. Beets make everything more beautiful. I had beet soup for lunch today and the color was loooovely. I love roasted beets. The salad sounds amazing. Oh I love beet very much. Love your salad here Lisa. Look delicious. This salad sounds too, too good! Love the combination of ingredients!! what a tasty salad this is!! I so love beets! I just bought beets at the multicultural market!! Ohhh! Nice one! We love the sound of this. We will make it soon. Best from Montecito. I agree, beets are so good when prepared right! This is a gorgeous beet salad - yum! I am a beet lover! And a lover of this salad and everything in it! Beautiful! I am on board with your beet mission. How could you not like beets, it is like mother nature said, here is a delicious vegetable that you can eat like candy. This is also my favorite way to eat roasted beets, in a simple salad. So good! Ooooh, I am drooling, the presentation is great. and I am interested in the parmesan dressing in particular ! Lovely Salad. My kids love beets. they will eat it even boiled! This is really a winning dish! (First of all, the plate is lovely and what a great idea to have a plate swap). I'm definitely need a bit of beet convincing: even though I made a golden beet sauce for ice cream, it's not an ingredient that I normally use (or eat). The dressing and all the different textures here make this dish so appealing! Congrats on your winning entry Lisa! Really like your presentation of the dish and how the beet is tinting the dressing with a swirl of red. Lovely! Can't wait to see what you'll be cooking up for battle Fennel. Made this tonight with orange beets. I fanned out the sliced beets and then lay the watercress across it horizontally. (I only had one bunch.) I also used walnuts because that I what I had. It made a beautiful presentation. Even those who said they didn't like beets enjoyed this dish. Nadine: Sounds fantastic! It must have looked great with your orange beets.